How can detect, in the outdoors with minimal equipment, if I am dehydrated or need electrolytes? Some background: I get overheated very easily, possibly because I don't sweat as much as most people around me (in the same conditions). When I get overheated I get migraines. I found that Hammer Strength Enduralytes (electrolytes*) really help with the Migraines. It'll basically keep a headache from turning into a migraine. I may just be overheating but I thought that perhaps I was low on electrolytes. Endurolyte contents: Sodium Chloride, Calcium Chelate, Magnesium Chelate, Potassium Chelate, Vitamin B6, Manganese Chelate, and L-Tyrosine all held together with Rice Flour. Second, pay attention to your thirst. Many of us ignore our bodies for hours at a time - postponing bodily functions during a commute, a meeting, a lecture, the workday, a movie, and so on. If you're working outside in the heat you need to pay attention to the signals from your body. If you're utterly unable to tell whether you're thirsty or not, then develop a habit of drinking every 30 minutes or the like, but it's better to regain the ability to listen to those signals. Third, learn what your urine is usually like when you're clearly not dehydrated because you're at home in your normal environment. What colour is it? (Not "what colour does it turn the water in the toilet?") If it gets much darker and stronger smelling than normal, you may be dehydrated. If it still seems normal, you are drinking at the correct rate and can relax. Fourth, learn your own idiosyncrasies. My lips get chapped (even in the summer) if I am not drinking enough. If yours are the same, learn to recognize the sign and increase your fluids. Many people get a "dehydration headache" - if you're outdoors working hard and get a headache that comes on quickly, get a litre of liquid inside you before you take a painkiller. Everything I've seen and read (example from the CBC) suggests that electrolyte replacement is only necessary for elite athletes who are sweating profusely and not eating regular food while doing so, and only after several hours of that. If there is salt in your snack foods and your meals, you can ignore electrolyte replacement worries. Dehydration occurs when there is more water going out or being used than is going in. Additionally, if you're drinking too fast (more than a litre an hour for an average adult male), you're not absorbing the water and so it doesn't count as going in. Confusingly, dehydration can also be classified loss of water, loss of electrolytes or loss of both. To add further confusion, electrolyte imbalance can be too high or too low. In one sense the electrolytes can be lost through something like sweating, and in another, the concentration can be too high due to lack of water. It's generally the electrolyte imbalance that causes you the problem and to the symptoms of dehydration are really the symptoms of electrolyte imbalance. Let's assume you've not got to the kidney failure end of matters, which causes electrolyte imbalance and that we're not accounting for medical conditions or medications. Instead stick to those which are associated with dehydration and the causes of dehydration. Dehydration reduces the ability of the kidneys to remove excess calcium from the body. This will cause mild hypercalcemia and is likely to by asymptomatic. Equally, an increase in chloride can have no symptoms, but in some cases can present with thirst, difficulty breathing and weakness. And high levels of potassium can cause heart rhythm problems. Low levels of magnesium can be caused by sweating and the symptoms are normally associated with severe dehydration. These include muscle weakness, shakes & twitches, nausea, vomiting, lower limb cramps and changes in blood pressure which if low could cause fainting. You are unlikely to get a phosphate imbalance due to dehydration as far as my research goes. Sodium is the annoying one as you can have both low sodium because you sweat it out and high sodium due to lack of free water. Symptoms of low sodium include headache, nausea, vomiting, confusion and fatigue. High sodium can cause increased thirst, confusion, lethargy and muscle twitches. So, my original list of symptoms of dehydration are actually symptoms of electrolyte imbalance, but for the first one. This is because they are so tightly linked. Your urine will be darker. You'll get a bunch of symptoms like lethargy and confusion which others are more likely to notice. Something to be aware of is that many of the above symptoms are also associated with thing that can happen outdoors such as heat stroke, hypothermia, sleep deprivation, malnutrition and low blood sugar. In terms of solutions. An imbalance where the concentration is too high can be solved by drinking more water. Where too low, you should go for oral rehydration and eating something. Six teaspoons of sugar, half a teaspoon of salt and a litre of water should do it. Don't forget to drink that little and often over an hour. The symptoms of dehydration and over-hydration are similar, and this can lead to occasional mistreatment. Symptoms common to both include headaches, confusion, loss of appetite, irritability, nausea and vomiting, muscle weakness, muscle cramps, and seizures. With the popularity of sports drinks and staying hydrated, exercise-associated hyponatremia (EAH) has become an increasing problem. As many answers here tackled dehydration, this answer somewhat emphasizes issues of over-hydration. A non-science based recommendation around 1990 regarding hydration led to over a hundred hospitalizations in the U.S. Army, and several fatalities, before the problem was recognized and corrected. However, the original recommendations also made it into American College of Sports Medicine guidelines as a recommendation to "drink as much as tolerable" during exercise. What color is your urine? Clear or straw-colored urine indicates adequate hydration, while dark or amber color suggests dehydration. How much water are you drinking? If the answer is more than a liter per hour, you should consider over-hydration as a potential issue. So, if your urine is too dark, drinking more is probably a good idea. Otherwise, you should only drink to thirst. Keep in mind that sports drinks do not contain sufficient sodium to correct low sodium levels; they will only worsen them. If EAH is suspected, salty foods or broth are a better option. Example case of over-hydrating: Exercise-associated hyponatremia. Article on EAH treatment guidelines: Wilderness Medical Society Practice Guidelines for Treatment of Exercise-Associated Hyponatremia. Do a google search for urine colour (or color) chart and you will find many charts showing examples of what your urine should look like when you are hydrated. or not. There are a lot of myths about water and dehydration: Drinking Water for Hiking: Myths and Facts. One of these is the belief that people are in danger of being dehydrated without knowing it. Dehydration is a serious medical condition that sets in long after thirst, and thirst is a powerful sensation that commands your attention. When people say casually, "I'm dehydrated," it's like saying "I'm OCD today" or "Of course I have Asperger's, I'm an engineer." It's taking trivial issues and pretending they're serious. You can tell you're dehydrated because you got thirsty many hours ago, you haven't had access to any water since then, and you're becoming so thirsty that it feels terrible and you're miserable. All you can think about is getting some water. Electrolyte imbalance is not something to worry about unless you're in the desert or running a marathon. Scaring people about electrolyte imbalance is a marketing strategy used by the people who make "sports drinks." The real sneaky killer is heatstroke. Heatstroke can kill you even when you're well hydrated. It's insidious, because your brain stops working, so you lose the ability to make good decisions and save yourself. Colour if urine is a good indicator. The lighter the colour, the better your hydration is. Once you start to feel thirsty, you are already dehydrated. You really don't need equipment as such. There are quite a few symptoms that you can observe, may be at a gradual rising rate. Symptoms are observed with as the degree of Dehydration gets worst. Extreme fussiness or sleepiness. This is more often observed in infants and children, because when they play a lot than they usually do, they forget about keeping themselves hydrated. This may be observed in adults as well. Very dry mouth, skin and mucous membranes. Its rather an advanced stage of the first. Little or no urination, any urine that is produced will be darker than normal. This can be correlated with #1 and #3. The more fluid you lose, you body metabolism is adjusted in way to preserve what it has, Osmoregulation mechanism doesn't cope with the need of dilation of Urine, ultimately resulting in darker urination. Dry skin that sags slowly into position when pinched up: Indicating that your sweat glands are dried and you are not gonna sweat much from now on if you don't hydrate. Decreased sweating and urination. The moment you observe that you are passing small amounts of urine infrequently (less than three or four times a day), that is where you should know that it has got worst. In my experience, it can be hard to tell the two apart, plus there is also ketosis to worry about. If you are exercising vigorously (cycling, running, vigorous climbing, etc.) for several hours and not eating much, you can consume all of the readily-available glucose in the body and begin burning protein instead. A waste product of burning protein in this fashion is ketones in the blood, which is OK in low levels but can become toxic fairly rapidly. This leads to the same light-headed sensation, weakness, stomach churn, and other symptoms as dehydration and low salt (and is easily mistaken for those), but, whereas the others can be fairly quickly corrected, if you operate in ketotic state for too long it can take you days to recover. To tell low salt from dehydration, I drink a relatively modest amount, and if I'm still thirsty I try to get something salty. If low salt is the problem then usually a modest amount of salt will perk you up a bit (though if it does you probably need more). I've never known urine color to be reliable, since various things (eg, vitamins) can color it, and some conditions (e.g. ketosis) can make you pee more and have lighter urine even if you're dehydrated. I asked my fitness instructor this question a few years ago. She had several things to say. Electrolyte replacement is for when you have been in a high cardio, sweating mode continually for an hour or more. Endurance runners and cyclists, yes. Gym bunnies, trampers, walkers, no. For long distance hiking (6 hours or more) she suggested that if I suffered from headaches on the drive home then perhaps I could put a bottle of electrolyte replacement in the car and drink it at the end of the trip. Otherwise, I should stick to water and the usual hiking snacks of peanuts, crackers, dried fruit and so on. In the gym, she said there should be nothing but water in my bottle and I should replace water lost exactly. I should stand on the scales with my full water bottle at the beginning of the workout and stand on the scales with my empty water bottle at the end of the workout and the two weights should be the same. Muscle cramps, especially in the leg, are a symptom of low electrolyte (salt) levels (though there are other possible causes). Note that they are not a symptom of dehydration, though the two often happen in conjunction due to sweating. I force myself to drink about half a liter more than on normal "office days" in the morning before I start a tour. If I do not have to pee every three or for hours, I have to drink more. If the pee has a discernible (yellowish) color, I have to drink more. the absolute amount of liquids depends widely on temperature, level of activity and surroundings (altitude!). if the weather is cold, I have to force myself to drink enough. variety helps, I carry some instant coffee, some sugar, sometimes instant meat broth, sometimes some electrolyte drink (powder) or a syrup to mix in my water. frequency and color of pee is the most important and also pretty accurate indicator for me, helping me to avoid headaches in the first place. Dried and cracked lips might be a late, but sure sign of dehydration. I also experienced headaches and a burning, feverish feeling in my face. Years ago I read a book called the bodies many cries for water. It is wriiten by a doctor, that has since passed away. Ithink he said from the age of 30 we can not distinguish between thirst and hunger and should drink first, then wait about 10? minutes and if then feel hungry eat. I have also read that it is good to drink water before going to bed to minimise dehydration while sleeping and on waking drink water, to rehydrate your body. I recenly had a SECA scan done that measures a variety of things including hydration, extracellular water and total body hydration. Overall it showed I needed to drink more water. Not sure what it costs for the scan in other countries, but I paid the equivalent of US$66. Also shows phase angle, which I was told relates to cellular health and info regarding Fat mass. hope this is helpful in some way. Can also buy roll of PH tape to test the PH level of your urine. Yellow is acid and drinking some apple cider vinegar(buy made from whole apples with the mother - eg Braggs brand) and drink a bit in small amount of water with each meal. will aid digestion and improve PH levels. I have recently read complete Idiots guide to thyroid disease. As the thyroid gland is referred to as the master gland suggest it is good to be familiar with the contents of this book. Thyroid health can have a large impact on your feeling of wellbeing. Also suggest have a look at Mickel therapy. Is the best thing I've seen regarding recognising our emotions and how to respond in a way that you clear negative emotions, rather than them building up, left unattended. Wish everyone happiness and wellbeing. Glad to contribute. It is a long time since I've been on a site about health and participated. Many activities in the body need water, so is worth being aware and cease to drink from plastic bottles. Food grade stainless steel or glass bottles are great. From a few years of hiking as an adult leader with the boy scouts (who are NOTORIOUSLY difficult to keep hydrated), I can say with certainty that symptoms vary between individuals. Personally, my muscles begin to cramp and I get a headache (in that order). These symptoms are fairly common. Many of the boys get nauseous. Some go through minor personality changes (grumpy, irritable). While urine color may be the best indicator of hydration, it is not reliable. I know that I don't urinate often when dehydrated. If I'm thinking I might be dehydrated, this would be a secondary symptom to confirm my suspicion. It's best to get into the habit of forcing yourself to drink frequently, and I acknowledge that this can be difficult. When I'm out hiking with the boys, I try to make note of water levels in the canteens I can see to make sure that they're being used. There's several good answers about dehydration, I thought I'd talk a bit about watching for low electrolytes - I found myself benefiting a great deal from adding some to my drinks even when my activity is fairly mild, so I disagree with the assertion that they are only useful in extreme cases. One thing to watch for is, as Karen mentioned in a comment, that too much water and not enough salt feels "sloshy". 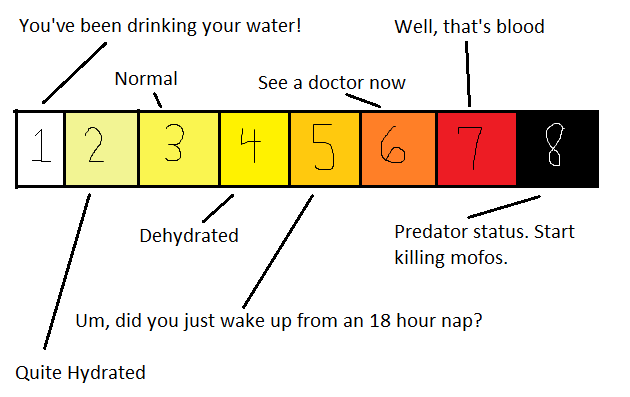 It feels like the water isn't helping, or like you haven't drunk enough or you have symptoms of low water even if you've drunk a lot and you feel heavy with the water, or you feel a bit nauseous and disinclined to drink even though you need it (sweating, etc). Another thing to watch for is wanting salt - like feeling foods are under-salted, or craving salty snacks. This can be rather subtle, it's easier to catch in retrospect than at the time since it meddles with perception, and instead of feeling like you need more it may well feel like you've just had less. This can also show up as wanting to eat - as in, the aforementioned sloshy feeling gets better if one eats between water breaks, but the salt level of the food tends to (in retrospect) matter more than the bulk. Salt (specifically, sodium) is one of the primary electrolytes, and relatively easy for the body to poke one to go looking for. Another possible symptom is fatigue, fuzzy-mindedness, difficulty concentrating, (slightly) blurred vision, or even headaches. Again, this can be pretty subtle, especially if it's mild - I actually only noticed the absence of such after I started adding salt to some of my drinks. A last possibility, and the easiest and most accurate, is to just add a bit of salt to your drink (half teaspoon or less per quart) - if it helps, then you needed it. If it tastes or feels good than it is probably worth adding salt to your water again, and paying attention to see if it helps in other ways - especially if the sensation is quite dramatic, that is one of the ways the body can communicate "yes, we need this". If salt intake in other areas (meals, etc) starts decreasing once you add a bit of salt to your drinks, then your salt intake is likely driven by need rather than desire, if it balances itself once you have enough. It's worth trying out, carrying a small water bottle laced with salt, etc - adding lemon and/or sugar are popular, salty lemonade is one of the easiest electrolyte drinks - or even just a tuck some salt, sugar, lemon packets, into a bag or pocket which you can mix into some water if you think you need it, which costs very little space or weight. The occasional sip when exerting can help you figure out how the body feels if or when you need electrolytes - if you want pure water, you're likely fine, if (after a bit of walking) the salty lemonade seems like the best idea ever - especially if it seems much more appealing than before you started sweating - then you likely need the salts. For myself, the first time I had salty lemonade it was eye-crossingly good, once I started adding salt to my drinks regularly it backed off to merely pleasant - since the body felt it no longer needed to hit me over the head to get enough. If it does help you, you can think about lacing your primary water supply, or looking for more elaborate mixes (potassium and calcium salts are next in importance, then those needed in trace amounts like magnesium etc). Or you can carry a small amount of something to mix with your water if/when you need it. Not the answer you're looking for? Browse other questions tagged safety survival hydration or ask your own question. How do I reliably diagnose my own dehydration? How can you identify whether brackish water is too salty to drink? How can I tell what time it is without a watch?